2003-07-25 Assigned to GENERAL DYNAMICS GOVERNMENT SYSTEMS CORPORATION reassignment GENERAL DYNAMICS GOVERNMENT SYSTEMS CORPORATION MERGER (SEE DOCUMENT FOR DETAILS). Assignors: GENERAL DYNAMICS ADVANCED TECHNOLOGY SYSTEMS, INC.
System for facilitating detection of network intrusion. Through continuous accumulation of network traffic parameter information, data for a particular session is reduced to a single metric that represents the threat potential of the session as compared to normal network traffic. An analysis station accumulates and maintains the historical data and defines a point for each specific session within a distribution. The dimensions in the distribution space take into account various network traffic parameters useful in identifying an attack. The distance between a session's point and the centroid of the distribution represents the threat metric. The analysis station can display the threat metric as a point or points on a display. The intensity of the point is an indication of the threat potential. The easy-to-read display calls anomalous traffic to the attention of an operator and facilitates discrimination among ambiguous cases. FIG. 1 describes the portion of the invention related to computing and scaling values to determining component metric values to be used in plotting a session point and determining a distance to produce the threat metric. FIG. 1 is presented in two parts, as FIGS. 1A and 1B. While a practical implementation of the invention in most embodiments will include other processes as described herein, the various processes and elements of the invention are easier to understand if one first has an understanding of the basic algorithm illustrated in FIG. 1. The various blocks indicate processes or steps acting on particular inputs and outputs, usually implemented as software. Individual summary parameters (SP's) are computed at steps  101, 103, 105, 107, 109, 111, 113, and 115, from the indicated traffic parameters. At step 117, three summary parameters are computed from one traffic parameter, the rate of SYN packets in the session. At 119, six summary parameters are computed from an original eight summary parameters. The initial eight summary parameters are computed from central moments of just two traffic parameters, the average time between packets, and the inverse average time between packets. The original eight summary parameters, including the central moments, are computed at step 121. Rate of synchronization/start (SYN) packets to a mail-related destination port. Denial-of-service (DOS) attacks on a mail server utilize multiple mail messages sent at a high data rate. This metric defines the single dimension C 7. Rate of all SYN packets, SYN rate divided by average packet size, and SYN rate over packet size over standard deviation of time between SYN packets. In a SYN DOS attack, SYN packets are sent at a high rate, the packet size is minimal, and they are usually uniformly spaced in time. Since these parameters are all related to SYN rate, they are grouped together and define dimensions C 8-C10 shown at 125 of FIG. 1. Rate of handshake violations observed. DOS attacks and probes often utilize components of the TCP handshake sequence (SYN, SYN ACK, ACK, FIN) but in sequences that violate the TCP handshake protocol sequence. This metric defines dimension C 11 in FIG. 1, and will be discussed in more detail later. Packet violation. There are illegal packet structures (such as same IP address for source and destination, as in a known type of attack called a Land attack) where one occurrence indicates anomalous activity that should raise an alarm. The value returned when the metric is computed indicates which particular anomaly was discovered, and no re-scaling is performed. Instead this metric directly serves as dimension C 12. Rate of change of destination port. Initial probes of a potential target often look for which ports are open, indicating which functions the machine performs as well as which ports may be used to attack the machine. Keeping track of all ports accessed in a session would require prohibitively large amounts of storage and processing. The algorithm in the present embodiment of the invention monitors the rate at which the destination port changes, a much more efficient measure of the same effect. This metric is used to create dimension C 13. Internet control message protocol (ICMP) ping rate. ICMP pings may be associated with an attack. Normal users may occasionally use ICMP pings. The process illustrated in FIG. 1 looks for higher rates of ICMP pings and uses a metric related to this parameter to form dimension C 14. Reset (RST) rate. Handshake violations sometimes cause the target machine to issue an RST packet. An attacker may issue an RST packet to interrupt initiation of a handshake sequence. Because RST packets also occur in normal traffic, higher rates of RST packets in a session are indicative of a potential problem, and this metric is used to form dimension C 15. Local security architecture remote procedure call (LSARPC or LSAR) packet rate. Higher rates of LSARPC packets indicate a known type of attack referred to as an NTInfoscan attack. This rate is used to for dimension C 16 in FIG. 1. Log-in failure. Repeated log-in failures (E-mail, Telnet) are likely to indicate someone attempting unauthorized access. Valid failures will occur due to typing errors. A number of failures above a threshold is viewed as a threat and the metric for this parameter forms dimension C 17. FIG. 1 illustrates how the component metrics are combined into the single threat metric. Distance D of a point in the 17-dimensional space defines the threat metric. For all parameters except packet violation, mean and standard deviation are computed during normal (non-attack) network operation to accumulate historical data, which characterize non-threat data at  128 in FIG. 1. Time periods where the metric distance exceeds a threshold for any session may indicate the presence of an attack and are not included in this averaging process. Separate averages are computed hourly for time of day and day of the week. Alternatively, they may be grouped together (9:00 to 5:00, Monday through Friday, for example). Holidays are assumed to be equivalent to weekend time. 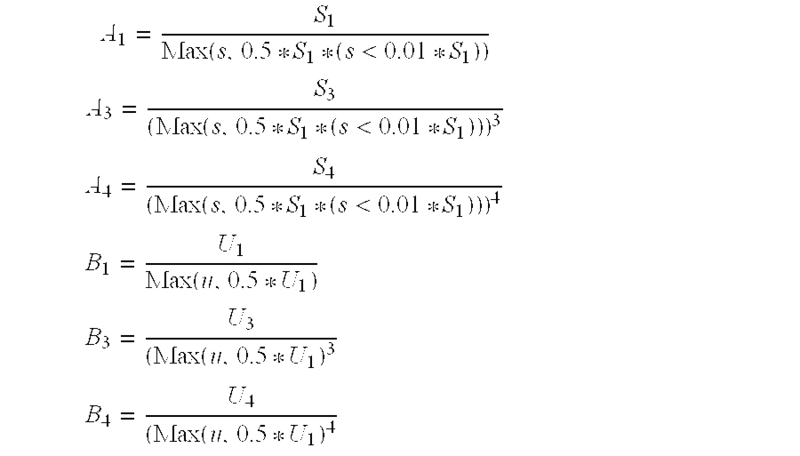 For each session, this “normal” mean is subtracted from the observed metric component value and the result is divided by the “normal” standard deviation. This in effect re-scales the data at 130 (except for packet violation) to convert what would have been an ellipsoidal distribution into a spherical distribution, so that each metric component has equal weight. The packet violation component is different in that a single occurrence indicates a violation. Thus, packet violations are assigned a large number, in a manner to be described in detail below. It cannot be overemphasized that not all summary parameters are scaled, and the amount of processing of summary parameters prior to any scaling varies. Sometimes intermediate summary parameters may result, as is the case with the first six component metrics. This will also be the case in handling one-to-many sessions, discussed later. Also, some component metrics are determined or produced by simply assigning a summary parameter value to the component metric when no scaling is needed, as in the case of packet violations. In such a case, the summary parameter and the component metric are in fact the same. FIG. 2 is a conceptual illustration to show how the plotted points for the various current sessions can help identify an anomalous session. For clarity, only three dimensions are shown in FIGS. 2, A, B, and C. In the case of the embodiment of the invention described herein, the plot would have 17 dimensions. Since each session, or data exchange between specific addresses, on the network is analyzed separately, normal data clusters in the spherical distribution  200, which appears oval due to the perspective view. An anomalous and possibly threatening session, 202, will appear as a point well removed from the distribution of points representing current sessions. Because of the spherical distribution, a single threat metric value characterizes each session and is determined by the distance of the session's point from the centroid or center point of the distribution. Since the normal data used for scaling some of the component metrics is collected and analyzed on an ongoing basis, the system can adapt to evolutionary changes in network traffic. With an understanding of the basic concept behind the scaling and measuring processes of the invention, it is straightforward to produce an embodiment that, in practical application, provides a useful system for threat determination and analysis. FIG. 3 is a flowchart illustrating the overall operation of such a system. The flowchart represents one iteration of updating a sessions data when a packet is captured. This process would continuously repeat for each session while a system according to the invention was in operation. At step  300 a packet is captured via TCP dump. Typically, a workstation is capturing packets on a network interface card operating in promiscuous mode. The packet is analyzed at 302 to determine if it represents a new session, or if it belongs to an existing session. In either case, it is associated with an appropriate session, either existing or newly created. At 304, the packet violation test is performed. A summary parameter, which is also the component metric, is assigned immediately and set as the appropriate dimension if there is a packet violation, since packet violations are not scaled. At 306, a determination is made as to whether the packet is an outgoing packet. If so, an outgoing handshake analysis is performed at 308. If not, an incoming handshake analysis is performed at 310. These two analyses are slightly different, and will be discussed in detail below. It should be noted that step 306 could have been framed in terms of whether the packet was an incoming packet. Appropriate summary parameters are computed at step  312. In the case of the time and inverse time between packets, these summary parameters include the central moments as previously described. At step 314 summary parameters are further processed and/or scaled as needed. The updated current session values are plotted again in an updated plot at step 316. The distance from the centroid of the distribution is determined at step 318. The last two steps in the flowchart of FIG. 3 are related to displaying the data on the monitor of an analysis station that is being used to implement the invention. Plotting the threat metric can often most easily be accomplished by converting the distance to an integer scale, as shown at step  320, for example, to any one of 256 or fewer integers on an integer scale where the higher the number, the greater the distance and hence the threat. In some embodiments this involves taking the logarithm of the distance threat metric as will be discussed later. Dynamic threshold and contrast as discussed in relation to FIG. 10 in this disclosure can be used. This integer value can then be plotted directly on a display at 322, for example, by mapping the value into one of 256 or fewer possible shades of gray on a gram-metric display. A gram-metric display will be described in more detail later, but it is essentially a way to display multiple dimensions on a two dimensional space, where one dimension, in the present case, time, is continuously scrolling up the screen. The next several flow diagrams illustrate how some of the specific processes referenced in FIG. 3 are carried out. FIG. 4 illustrates how a new packet is captured and associated with an existing session, or a new session if the packet is indicative of a new session being started. FIG. 4 is presented as FIGS. 4A and 4B for clarity. The steps illustrated in box  400 are related to looping through existing sessions to try to match the packet up, while the steps illustrated in box 402 are related to creating a new session. A packet is received from the TCP dump at 404. Steps 406 and 408 compare the packet source and destination IP addresses with those for existing sessions. The system starts with the most recent session and moves backwards at step 410 each time there is no match. Moving backwards is efficient because the packet is likely to be a continuation of an ongoing session and starting with the most recent sessions will often save searching time. Also, if a session is broken into segments because of a long gap in activity, it is desirable to have the new packet to be identified with the latest segment. If the packet source and destination IP addresses match some current session, time since the last packet in that session is checked at 412 against an operator-settable value to see whether the time gap is too great and a new session should be initiated. If no matching session is found, if the time gap is too great, or if the Startflag for the matching session is +1 or −1 at step  414 (indicating a non-standard first packet for the session), a new session is established as indicated in the box. If the new packet is SYN at step 416, ICMP at step 418 or NTP at step 420, the relationship between packet source and destination can be used to unambiguously establish session client and server, as shown. In the case of a SYN packet, the Startflag is 2 at step 422. In the case of an ICMP packet, the Startflag is 6 for an echo request and −6 for an echo reply, as shown at steps 424 and 426, respectively. In the case of an NTP packet, the Startflag is 8 for a request at step 428, and −8 for a reply at 430. Otherwise an attempt to make an educated guess at the relationship using the RefIP value is made as described below. Note that the assignment of Startflag values is arbitrary, and simply represents a way to keep track of the logic that led to initiating a session. Note that the destination address is also added to RefIP at step  422 of FIG. 4 if it was not previously included when a SYN packet for a new session is detected. RefIP contains a list of previously identified server addresses. This list is initialized to known system servers prior to program execution and servers are added as they are found during execution. Addresses occurring earlier in the list are more apt to be the “server” for some new session than those occurring later. If the new packet is a SYN for a session previously having a Startflag of +1 or −1, the session is re-initialized and earlier data are discarded. The educated guess is made by checking RefIP at step 432. If neither address in the packet matches anything in RefIP, a session is initialized at step 434. If both source and destination matches, the first occurrence in RefIP is taken as the destination at step 436. Otherwise, a single match results in the packet simply being associated with that address at step 438 for the destination address, and step 440 for the source address. FIG. 5 is a flow diagram illustrating further detail on how the packet violation tests are performed. FIG. 5 is divided into FIGS. 5A and 5B for clarity of presentation. PV(j) denotes the packet violation metric value for session j. The metric is 3000 plus the number assigned to the attack. Each step in the flow diagram where a metric is assigned is labeled with this number in parenthesis. If destination and source IP addresses are identical at step  500, the packet is a Land attack, and PV(j) is set to 3002 immediately at step 502. Other assignments are made based on the flow diagram at steps 504, 516, 506, 508, and 510. For example, if the packet is a ping request, the destination is a broadcast address (X.X.X.255), and the previous ping request in that session was not X.X.X.254, indicating that the current packet is not part of an IP sweep, the attack is a Smurf attack and PV(j) is set to 3003 at 504. If both the SYN and FIN flags are set, the attack is a SynFin attack and PV(j) is set accordingly at 516. The final test in FIG. 5 is performed at step  512. The test is for content-oriented threat detection, performed only on outgoing packets. If a sub-string in the summary field of the highest protocol level matches a threat type sub-string, PV(j) is set to the proper identifier indicative of that threat at step 514, as covered in the previous table. Since Telnet sends only a single character at a time, a string of 20 characters is kept for testing on each Telnet session. Each new Telnet character is appended on the right end of that string, and the left-most character is dropped. FIGS. 6 and 7 describe how handshake parameter violations are monitored and used to produce a summary parameter in accordance with some embodiments of the invention. FIG. 6 presents a high-level overview of how handshake violations are determined. Many denial-of-service attacks and network probes employ violation of the TCP handshake sequence. The invention implements a detailed analysis of that handshake sequence. FIG. 6 shows the transitions that are allowed. The usual handshake sequence is SYN, followed by SYN ACK, followed by ACK, and this is shown at  600, 602, and 604 for client to server initialization and at 612, 614, and 616 for server to client initialization, respectively. FIN packets are not usually considered part of the handshake sequence. However, since out-of-sequence FIN packets can also be used to mount an attack, the algorithm of this embodiment of the invention generalizes the handshake sequence to include FIN packets, as shown at 606 and 608 for client to server and 618, and 620 for server to client. Packets indicated at 610 and 622 can be any packet except SYN or SYN ACK. For transitions indicated in bolded arrows, destination and source ports, and acknowledgement number are verified. For transitions indicated in normal arrows, only destination and source ports are verified. Violation of the allowed sequence structure leads to an alarm condition. Note that the flag values in FIG. 6 represent the current state of the session within the handshake sequence, so that they are not “startflags” in the same sense as the flag values shown in FIG. 4. FIG. 7 shows the logic flow for the TCP handshake processing of an outgoing packet. FIG. 7 is presented as FIGS. 7A and 7B. The packet is first analyzed to see whether the packet is one of the elements of the handshake process, SYN at  702 (no ACK number), SYN ACK at 704, ACK at 706, or FIN at 708. If not, there is no further analysis required. Then a check is made to determine if the packet might be a re-transmission of an earlier handshake component at any of 710, 712, 714, 716 depending on the which element the packet represents (otherwise we might erroneously label it a violation of handshake protocol). If the packet is SYN, a determination is made at 718 and 720 as to whether a new sub-session can be opened; if not, there is an excess number of SYN initiations that were not completed, and Halarm is incremented at 722 since this is probably indicative of a SYN attack. If the packet is SYN ACK, a check is made at 724 to determine whether it is responding to an open SYN. If not, a SYN ACK attack or probe is indicated and Halarm is incremented at 726. Likewise, if the packet is ACK, a check is made to determine whether it is responding to an open SYN ACK at 728. If not, a check is made at 730 to determine whether its source and destination ports are consistent with an existing subsession, since ACK's are commonly used in normal session communication. If not, the ACK may be part of an ACK attack or probe so Halarm is incremented at 732. Once processing has passed beyond the initial SYN-SYN ACK-ACK sequence, acknowledgement and sequence numbers are not tracked, since that would require a lot of logic and processing. Finally, if the packet is FIN, a check is made to determine whether it represents a legal continuation of allowed packet transitions at 734. If the packet has not been preceded by a valid handshake opening sequence, it may be part of a FIN attack and Halarm is incremented at 736. When processing is first begun, the system is likely to see a few apparent violations simply because we have missed earlier portions of a valid handshake sequence. Thus the component metric for handshake violation has a threshold greater than one to avoid false alarms. At  738, 739, 740, and 741, values used to keep track of the current handshake state details are updated. The meaning of the values indicated in at these steps in FIG. 7 are given in the table above. Reduction of the multi-dimensional metric space to a single distance parameter enables a comprehensive display, which is referred to herein as a “gram-metric” display, to alert an operator to all network events of significance over recent time. FIG. 8 portrays the video display format for the gram-metric display generated using the metric distance developed above. On this display time runs along the vertical (Y) axis  800, and sessions are presented along the horizontal (X) axis 802. The distance metric for each session at each look time is mapped into the sequence of integers available to describe gray levels, by first taking the logarithm of the metric level and then mapping that into the gray level range. The lowest value corresponds to black and the highest level corresponds to white for maximum visibility of the displayed structures. This results in pixels displayed on a black background. Note that FIG. 8 is black/white reversed for clarity of the printed image. The gray level for a particular session at a particular time is painted on the display at the coordinates corresponding to that session and that time. In addition, if the metric value is above some threshold, a colored “shadow” (for example, pink) is painted to the side of the pixel whose length is related to the amount that the metric value exceeds the threshold as shown at 804, 805, and 806. The legends, including those indicating specific types of attacks, “Satan”, “Neptune”, and “Portsweep”, are meant to clarify the illustrative example display in the drawing—such legends may or may not appear in an actual display. An implementation could easily be developed where more than one threshold is set, and the shadow is one color if the first threshold is exceeded, another color for the next threshold, etc. This serves to alert the operator to the most threatening developments. As new look data become available, they are painted in a horizontal line at the bottom of the display and the older data automatically scroll upward. That newest set of data paints several pixels at a time to enhance visibility of new threatening activity (earlier time looks paint only a single pixel). It is important to recognize that the gram-metric display described above can be created and updated based on any threat metric that constitutes a single numerical value that characterizes the threat to a network of a particular session at a particular time. This numerical value need not have been generated by the multi-dimensional plotting and distance algorithm that has been discussed thus far. It can be generated by any algorithm, or even wholly or partly by manual means. All that is required to create the gram-metric display according to this embodiment of the invention is a single value characteristic of the threat, that can then be mapped into an integer scale useful in setting gray level or any other display pixel attribute. FIG. 9 illustrates the process for creating and updating the display in flowchart form. It is assumed an integer value is provided that corresponds to the described display attribute, in the case of gray levels, a single value on a scale of  256. The display is created with sessions along the X axis, time along the Y axis, and a local pixel attribute representing an integer value of threat probability. Each time step  902 is reached, the display scrolls upwards. At step 904, the current number of sessions is set, and processing is set to the first of these. At step 906, a new integer value is obtained and plotted for the current session and time. At 910, a check is made to determine if that value exceeds a set threshold. It is assumed for purposes of FIG. 9 that the embodiment described operates with only one threshold. If the threshold is exceeded, the new pixel or pixels are highlighted at step 912, as with the color shadow previously described. If the threshold is not exceeded, processing continues to step 914, where a determination is made as to whether all sessions have been plotted for the current time. If not, plotting of the next session begins at 918. If so, plotting for the next time begins as the display scrolls upwards at step 902. (It could also be implemented to scroll downwards.) At this point, the number of sessions is updated if necessary, as it may have changed and the current session is again set to the first one. The updating of the number of sessions may require re-drawing on the screen since the X axis scale may need to be changed. In any case, data for past times is simply re-displayed from memory when the display is updated. The process of doing calculations and determining at what intensity to display the data is only carried out for the most recent time. The display system of the present invention employs a capability to dynamically adjust the effective detection threshold and the display contrast in the region of that threshold to aid the operator in evaluating ambiguous events. FIG. 10 illustrates a graphic that might be displayed and controlled with a mouse to accomplish this, and therefore lends to an understanding of how this works. The three curves represent three one-to-one mappings of distance metric value into display gray level. The X position of the control point sets the detection threshold (the place where the mapping curve crosses the output level 0.5, shown by the dotted horizontal line) and its Y position sets the contrast (slope where the mapping curve crosses the output level 0.5). As the operator moves the control point the mapping is continually recomputed and the change in the display is immediately visible. Three possible positions for the control point and mappings for those three positions are shown in FIG. 10. Control point  1002 corresponds to mapping line 1012, control point 1003 corresponds to mapping line 1013, and control point 1004 corresponds to mapping line 1014. This kind of dynamic change can make the operator aware of subtle features that are not obvious in a static display. Then each component is divided by that square root to form the set of direction cosines in a 7-dimensional space. The cosines are tested for values as indicated at  1100 in FIG. 11. Discrimination test values were based on observed metric values obtained. The values can be modified if necessary, and other threats can be added based on observed values for a particular network installation. Note that for failed login the server can be displayed. Also, codes for packet violations can be given at 1104 when a packet violation is identified. The codes from FIG. 5 are used. Alternatively, the system can be designed to translate these into text, as shown in FIG. 11. While it is certainly possible to implement all the functions of the invention on a standalone personal computer or workstation, for most networks, it may be desirable to split the data capture/parameter measuring functions with the analysis/display functions onto two types of workstations. The former is referred to herein as a monitoring agent or data capture station, and the latter is referred to herein as an analysis station. Either type of station can be implemented on a general purpose, instruction execution system such as a personal computer or workstation. In the example embodiments discussed herein, the analysis station also maintains the historical data. This split of function does mean that some network traffic is devoted to exchanging data between the workstations involved in implementing the invention. However, the amount is small thanks to the fact that only metrics which consist largely of moments or other summary values for the network traffic parameters are sent from the monitoring agents to the analysis station. That communication can occur either on the network being monitored, or, for higher security, on a separate, parallel network. The system consists of an unspecified number of data capture stations and one (or more) analysis stations. FIG. 12 is a representative network block diagram, where three data capture stations serving as monitoring agents,  1200, 1202, and 1204 (also labeled Agent 1, Agent 2 and Agent 3) are each capturing all the data they are capable of seeing. They digest the data from all packets, sorting it according to session (which is a unique combination of IP addresses), and obtaining network parameters from which summary parameters (some of which may be the component metrics themselves) are created (moments and related descriptors). These summary parameters for each session are sent back over the network periodically (perhaps every three or four seconds, which is called herein, the look interval) to the analysis station, as indicated by the arrows. The network of FIG. 12 is typical, but there are infinite network configurations in which the invention will work equally well. The network of FIG. 12 also includes clients  1206, 1208, 1210, 1212, and 1214. Two switches are present, 1216 and 1218, as well as routers 1220 and 1222. Servers 1224 and 1226 are connected to switch 1216. Note that Internet connectivity is provided through firewall 1228. An analysis station could be placed outside the firewall, and firewall 1228 would then be provisioned to allow appropriate network traffic between outside monitoring again, and the analysis stations, 1230. The example of FIG. 12 shows only one analysis station. It would be a simple matter to include others. Each data capture station is capable of being controlled (data capture started, stopped, etc.) by messages sent over the network or the parallel network, if so implemented, from the analysis station. Each data capture station has two network interface cards (NIC): one operates in promiscuous mode to capture all data flowing on the network segment it connects to, and the other serves to transmit messages to the analysis station and receive messages from the analysis station,  1230. Captured data on a common Ethernet network consists of all messages flowing in the collision domain of which the monitoring again is a part. In future networks which have evolved to switched networks, which have less extensive collision domains, data capture can be effected by mirroring all ports of interest on a switch onto a mirror port on the switch, which is then connected to the data capture station. Monitoring agents are installed only on those network segments where monitoring is required. Next the additional data capture stations are compared one by one with the reference agent data (possibly already augmented by packets from other monitoring agent). The most recent packet in the current reference data look (the look interval is the interval between successive transmissions from a given data capture station) has time stamp t 4, as shown in FIG. 13. FIG. 13 shows a reference data time scale, 1300, along with a new station data time scale, 1302. Each packet from the new station data will be compared to packets in the reference data having time stamps within time w of the new station data packet time stamp. Thus the latest time stamp that can be considered for comparison testing is t3=t4−w. (New station data with time stamps later than t3 will be compared with reference data after the next look is received.) The latest time considered for match from the previous look was t2. Assume a packet index Ni corresponds to a time ti. The packet index N2 corresponding to t2 was saved during processing for the previous look. Thus all new station packets from N2+1 to N3 (the packet index for the last packet whose time stamp is less than t3) will be compared against the reference data. FIG. 13 shows this comparison for one of those packets whose time stamp is to. That packet will be compared against all reference data packets with time stamps lying within time w of t0. If a match is found, t0 and the time corresponding to the matching reference data packet will be furnished to computation of time offset between the reference station and the new station. If no match is found, the packet corresponding to time t0 in the new station data is added to the reference data. Normally, data collection for a given look begins with the arrival of a message from the reference station; earlier arrivals from other stations are ignored. It ends when exactly one message has been received from each data capture station. Once the comparison process is complete for all stations, computation of metric components may be performed. FIG. 14 illustrates an instruction execution system that can serve as either an analysis station or a data capture station in some embodiments of the invention. It should also be noted that one workstation could perform both functions, perhaps quite adequately in some networks. FIG. 14 illustrates the detail of the computer system that is programmed with application software to implement the functions. System bus  1401 interconnects the major components. The system is controlled by microprocessor 1402, which serves as the central processing unit (CPU) for the system. System memory 1405 is typically divided into multiple types of memory or memory areas such as read-only memory (ROM), and random access memory (RAM). A plurality of standard input/output (I/O) adapters or devices, 1406, is present. A typical system can have any number of such devices; only two are shown for clarity. These connect to various devices including a fixed disk drive, 1407, and a removable media drive, 1408. Computer program code instructions for implementing the appropriate functions, 1409, are stored on the fixed disc, 1407. When the system is operating, the instructions are partially loaded into memory, 1405, and executed by microprocessor 1402. The computer program could implement substantially all of the invention, but it would more likely be a monitoring agent program if the workstation were a data capture station, or an analysis station program if the workstation were an analysis station. Additional I/O devices have specific functions in terms of the invention. Any workstation implementing all or a portion of the invention will contain an I/O device in the form of a network or local area network (LAN) adapter,  1410, to connect to the network, 1411. If the system in question is a data capture station being operated as a monitoring agent only, it contains an additional network adapter, 1414, operating in promiscuous mode. An analysis station, or a single workstation performing all the functions of the invention will also be connected to display, 1415, via a display adapter, 1416. The display will be used to display threat metrics and may produce a gram-metric display as described. Of course data capture stations can also have displays for set-up, troubleshooting, etc. Also, any of these adapters should be thought of as functional elements more so than discrete pieces of hardware. A workstation or personal computer could have all or some of the adapter entities implemented on one circuit board. It should be noted that the system of FIG. 14 is meant as an illustrative example only. Numerous types of general purpose computer systems and workstations are available and can be used. Available systems include those that run operating systems such as Windows™ by Microsoft, various versions of UNIX™, various versions of LINUX™, and various versions of Apple's Mac™ OS. FIG. 15 extends the flow diagram of FIG. 1 to include these one-to-many sessions. The treatment is consistent with the 17 component treatment described above; the output can portrayed separately on the gram-metric display. An IP scan interrogates multiple IP addresses by addressing ICMP echo requests to them. If an ICMP echo reply is received, the IP address interrogated is active. Analysis begins by sorting the session data by client IP address at  1502. All servers accessed by a given client will be analyzed, looking for ICMP echo requests. A kernel which is a function of the number of ICMP echo requests and total number of packets in each session is computed at 1504, then summed over all sessions associated with that client. Thus this sum reflects the number of echo requests per session as well as the number of sessions containing echo requests (if there are no echo requests, the sum will be zero). To form the equivalent of a summary parameter at 1506, which in this case is the component metric, that sum is raised to a power, then limited not to exceed 100000 to avoid generating extremely large values in some cases. These one-to-many super-sessions (one for each client) can be displayed along with the one-to-one sessions, with the same detection characteristics applied. Distributed scenarios can be used for attacks or scans. The system looks for handshake violations or destination port changes from multiple clients associated with a given server. Handshake and port change analysis is performed in parallel, with component metric value obtained for each component for each server. Analysis begins by sorting the session data by server IP address at  1508. As in IP scan detection, a kernel which is a function of the total number of packets and either the number of handshake violations or the number of port changes is computed, then summed over all subsessions associated with that client at 1510 and 1512. This kernel represents an event rate summary parameter at 1514 and 1515. To form the metric distance, that event rate sum is scaled at 1516 and 1518 by the equivalent quantity for normal background data, 1520, as was done for the metric components in one-to-one sessions to obtain a spherical distribution. Values obtained are directly commensurate with component metrics obtained for one-to-one sessions. These one-to-many supersessions (in this case, one for each server) can be displayed along with the one-to-one sessions, with the same detection characteristics applied. Component metrics in this case are designated S1, S2, and S3, and are shown at 1520. The threat metric is the distance of the point from the centroid for this super-session, just as before, and is designated D′ as shown at 1520. Detailed equations are included in the list at the end of the specification. Total number of SYN packets in session where destination port indicates mail ( 24, 25, 109, 110, 113, 143, 158 or 220): M.
Use C i instead of Ci in equation for C.
ICMP count component:   IC = [ I * ( I + 4 ) ( A   b   s  ( P - 1.6 * I ) + 10 ) 2 ] 2  IQ = IC 0.002  S 3 = IQ 1 + 0.000001 * IQ Note  :   0.002   rather   than   average   over   sessions is   used   for   normalization   because   there   are   so few   samples   that   could   be   used   for   normalization . determining a distance of the point from a centroid of the distribution to produce the threat metric. 2. The method of claim 1 wherein the plurality of traffic parameters comprises time between packets and inverse time between packets, and wherein the producing of the plurality of summary parameters further comprises computing central moments of the time between packets and the inverse time between packets. producing nonlinear generalizations of rates. 4. The method of claim 1 further comprising displaying the threat metric on a gram-metric display in connection with a network address associated with the specific session. 5. The method of claim 2 further comprising displaying the threat metric on a gram-metric display in connection with a network address associated with the specific session. 6. The method of claim 3 further comprising displaying the threat metric on a gram-metric display in connection with a network address associated with the specific session. 7. The method of claim 4 wherein the specific session comprises a plurality of subsessions associated with the network address, and wherein the producing of the plurality of summary parameters comprises summing a kernel over all of the plurality of subsessions. 8. The method of claim 5 wherein the specific session comprises a plurality of subsessions associated with the network address, and wherein the producing of the plurality of component metrics comprises summing a kernel over all of the plurality of subsessions. 9. The method of claim 6 wherein the specific session comprises a plurality of subsessions associated with the network address, and wherein the producing of the plurality of component metrics comprises summing a kernel over all of the plurality of subsessions. 10. The method of claim 1 wherein the plurality of traffic parameters comprises an indication of whether a packet violation exists, and the producing of the plurality of summary parameters comprises assigning a number to the packet violation. 11. The method of claim 2 wherein the plurality of traffic parameters further comprises an indication of whether a packet violation exists, and the producing of the plurality of summary parameters further comprises assigning a number to the packet violation. means for determining a distance of the point from a centroid of the distribution to produce the threat metric. 13. The system of claim 12 further comprising means for displaying the threat metric on a gram-metric display in connection with a network address associated with the specific session. displaying an indication of the distance for each specific session in connection with a network address associated with the specific session specific session as an indication of the threat potential. 15. The method of claim 14 wherein the plurality of component metrics comprises at least seven component metrics. 16. The method of claim 14 wherein at least one of the plurality of current sessions is a one-to-many session comprising a plurality of subsessions associated with the network address. 17. The method of claim 15 wherein at least one of the plurality of current sessions is a one-to-many session comprising a plurality of subsessions associated with the network address. 18. The method of claim 14 further comprising highlighting the indication if and when the distance for the specific session exceeds a pre-determined threshold. 19. The method of claim 15 further comprising highlighting the indication if and when the distance for the specific session exceeds a pre-determined threshold. 20. The method of claim 16 further comprising highlighting the indication if and when the distance for the specific session exceeds a pre-determined threshold. 21. The method of claim 14 further comprising highlighting the indication if and when the distance for the specific session is at least as great as a pre-determined threshold. 22. The method of claim 15 further comprising highlighting the indication if and when the distance for the specific session is at least as great as a pre-determined threshold. 23. The method of claim 16 further comprising highlighting the indication if and when the distance for the specific session is at least as great as a pre-determined threshold. instructions for displaying an indication of the distance for each specific session in connection with a network address associated with the specific session specific session as an indication of the threat potential. 25. The computer program product of claim 24 wherein the plurality of component metrics comprises at least seven component metrics. 26. The computer program product of claim 24 further comprising instructions for highlighting the indication if and when the distance for the specific session exceeds a pre-determined threshold. 27. The computer program product of claim 25 further comprising instructions for highlighting the indication if and when the distance for the specific session exceeds a pre-determined threshold. 28. The computer program product of claim 24 further comprising instructions for highlighting the indication if and when the distance for the specific session is at least as great as a pre-determined threshold. 29. The computer program product of claim 25 further comprising instructions for highlighting the indication if and when the distance for the specific session is at least as great as a pre-determined threshold. a display operably connected to the processing system, the display further being operable under the control of the processing system to display an indication of the distance for each specific session in connection with a network address associated with the specific session as an indication of the threat potential. 31. The system of claim 30 wherein the plurality of component metrics comprises at least seven component metrics. 32. The system of claim 30 wherein the display is further operable to highlight the indication if and when the distance for the specific session exceeds a predetermined threshold. 33. The system of claim 31 wherein the display is further operable to highlight the indication if and when the distance for the specific, session exceeds a predetermined threshold. 34. The system of claim 30 wherein the display is further operable to highlight the indication if and when the distance for the specific session is at least as great as a pre-determined threshold. 35. The system of claim 31 wherein the display is further operable to highlight the indication if and when the distance for the specific session is at least as great as a pre-determined threshold. sending the plurality of summary parameters to an analysis station over the packet network. 37. The method of claim 36 wherein the plurality of traffic parameters comprises time between packets and inverse time between packets, and wherein the producing of the plurality of summary parameters further comprises computing central moments of the time between packets and the inverse time between packets. 38. The method of claim 36 wherein the plurality of traffic parameters comprises an indication of whether a packet violation exists, and the producing of the plurality of summary parameters comprises assigning a number to the packet violation. 39. The method of claim 37 wherein the plurality of traffic parameters comprises an indication of whether a packet violation exists, and the producing of the plurality of summary parameters comprises assigning a number to the packet violation. 40. The method of claim 36 wherein the producing of the plurality of summary parameters further comprises producing rates computed against numbers of packets. 41. The method of claim 37 wherein the producing of the plurality of summary parameters further comprises producing rates computed against numbers of packets. 42. The method of claim 36 wherein the producing of the plurality of summary parameters further comprises producing nonlinear generalizations of rates. 43. The method of claim 37 wherein the producing of the plurality of summary parameters further comprises producing nonlinear generalizations of rates. a second network interface operatively connected to the processing system operable to forward the plurality of summary parameters to an analysis station. 45. The system of claim 44 wherein the plurality of traffic parameters comprises time between packets and inverse time between packets, and wherein the producing of the plurality of summary parameters further comprises computing central moments of the time between packets and the inverse time between packets. 46. The system of claim 44 wherein the plurality of traffic parameters comprises an indication of whether a packet violation exists, and the producing of the plurality of summary parameters comprises assigning a number to the packet violation. 47. The system of claim 45 wherein the plurality of traffic parameters comprises an indication of whether a packet violation exists, and the producing of the plurality of summary parameters comprises assigning a number to the packet violation. 48. The system of claim 44 wherein the producing of the plurality of summary parameters further comprises producing rates computed against numbers of packets. 49. The system of claim 45 wherein the producing of the plurality of summary parameters further comprises producing rates computed against numbers of packets. 50. The system of claim 44 wherein the producing of the plurality of summary parameters further comprises producing nonlinear generalizations of rates. 51. The system of claim 45 wherein the producing of the plurality of summary parameters further comprises producing nonlinear generalizations of rates. instructions for sending the plurality of summary parameters to an analysis station over the packet network. instructions for displaying an indication of the distance for each specific session in connection with a network address associated with the specific session as an indication of the threat potential. 54. The computer program product of claim 52 wherein the plurality of traffic parameters comprises time between packets and inverse time between packets, and wherein the instructions for producing of the plurality of summary parameters further comprise instructions for computing central moments of the time between packets and the inverse time between packets. 55. The computer program product of claim 53 wherein the plurality of traffic parameters comprises time between packets and inverse time between packets, and wherein the instructions for producing of the plurality of summary parameters further comprise instructions for computing central moments of the time between packets and the inverse time between packets. 56. The computer program product of claim 52 wherein the plurality of traffic parameters comprises an indication of whether a packet violation exists, and the instructions for producing of the plurality of component metrics further comprise instructions for assigning a number to the packet violation. 57. The computer program product of claim 53 wherein the plurality of traffic parameters comprises an indication of whether a packet violation exists, and the instructions for producing of the plurality of component metrics further comprise instructions for assigning a number to the packet violation. 58. The computer program product of claim 52 wherein the instructions for producing of the plurality of component metrics further comprise instructions for producing rates computed against numbers of packets. 59. The computer program product of claim 52 wherein the instructions for producing of the plurality of component metrics further comprise instructions for producing nonlinear generalizations of rates. 60. The computer program product of claim 53 wherein the instructions for producing of the plurality of component metrics further comprise instructions for producing rates computed against numbers of packets. 61. The computer program product of claim 53 wherein the instructions for producing of the plurality of component metrics further comprise instructions for producing nonlinear generalizations of rates. 62. The computer program product of claim 53 wherein the instructions for producing the plurality of component metrics further comprise instructions for producing the plurality of component metrics for any of the plurality of current sessions which is a supersession comprising a plurality of subsessions associated with a network address. 63. The computer program product of claim 55 wherein the instructions for producing the plurality of component metrics further comprise instructions for producing the plurality of component metrics for any of the plurality of current sessions which is a supersession comprising a plurality of subsessions associated with a network address. 64. The computer program product of claim 57 wherein the instructions for producing the plurality of component metrics further comprise instructions for producing the plurality of component metrics for any of the plurality of current sessions which is a supersession comprising a plurality of subsessions associated with a network address. 65. The computer program product of claim 60 wherein the instructions for producing the plurality of component metrics further comprise instructions for producing the plurality of component metrics for any of the plurality of current sessions which is a supersession comprising a plurality of subsessions associated with a network address. 66. The computer program product of claim 61 wherein the instructions for producing the plurality of component metrics further comprise instructions for producing the plurality of component metrics for any of the plurality of current sessions which is a supersession comprising a plurality of subsessions associated with a network address. 67. The computer program product of claim 52 wherein the plurality of traffic parameters comprises an indication of whether a packet violation exists, and the instructions for producing of the plurality of component metrics further comprise instructions for assigning a number to the packet violation. 68. The computer program product of claim 53 wherein the plurality of traffic parameters comprises an indication of whether a packet violation exists, and the instructions for producing of the plurality of component metrics further comprise instructions for assigning a number to the packet violation. 69. The computer program product of claim 53 wherein the component metrics comprise at least seven component metrics. 70. The computer program product of claim 69 wherein the instructions for producing the plurality of component metrics further comprise instructions for producing the plurality of component metrics for any of the plurality of current sessions which is a supersession comprising a plurality of subsessions associated with a network address. Provos 2004 A Virtual Honeypot Framework.